Most of these designers have done their studies in London’s prestigious fashion schools and decided to stay afterwards as the city - which is known as the edgiest major fashion arena with a great underground scene - offers them the best opportunity to be noticed and make it big. And if you wonder about the LFW effect. It really is magical. The shows are all packed. I hardly made it to one (partly my fault as I left it too late to ask!) but had the opportunity to speak with some of the other designers’ representatives who promised me a interview after all the fashion weeks madness is gone. P.S. In order to keep this post at readable length I will include only one review today and post the rest daily starting tomorrow! The most anticipated of these shows was that of Eudon Choi on day one. And the Korean-born designer didn’t disappoint. It actually came more of a surprise, as it was so fresh and inspiring. 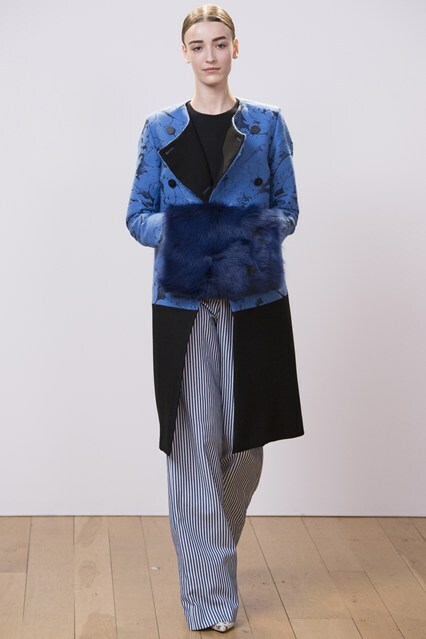 Choi who is known for his impeccable tailoring and blending of masculine cuts with feminine touch (his background is in menswear) has departed partly from the more edgy and geometric to bring us some soft lines and details – influenced by Russian folklore dressing. The whole collection looked romantic but sophisticated true to the inspiration behind it which is David Lean’s film Doctor Zhivago. I loved how culturally-rich, artistic yet wearable this collection looked. From the beautiful brocade mid-length skirts to stunning embroidery-like details which popped out like 3D flowers but in a much more sophisticated style. For this particular technique, the designer has worked with Swarovski on developing a special embellishment called ‘Crystal Rocks’ which added that extra luxury touch to the ensembles. Leather was also featured – although much less than previous collections – in form of jackets which once teamed with the softer pieces gave a complete and unique look. Here are some of my favourite looks from the collection. Can’t wait to see more from Eudon Choi!!! Keep reading over the next week or so for more on the Asian invasion of London Fashion Week.